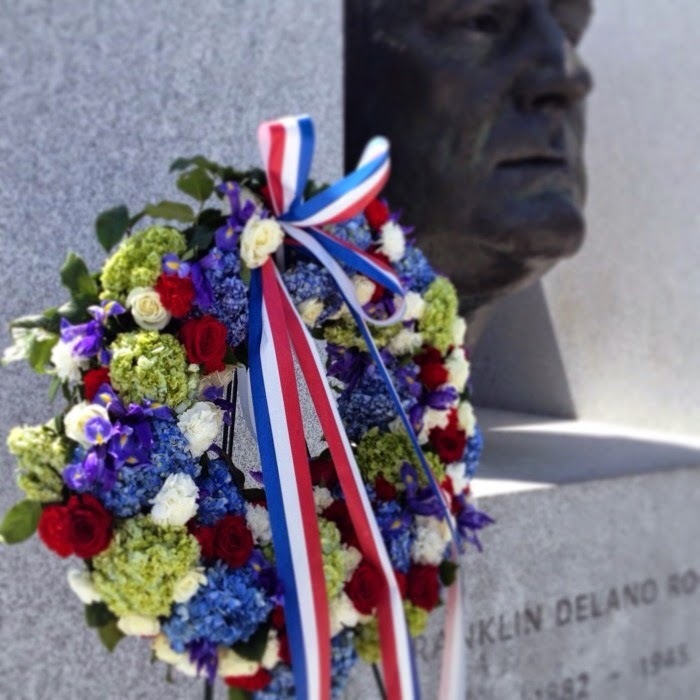 The Roosevelt Island FDR Four Freedoms Park Commemorates the 70th anniversary of President Franklin D. Roosevelt's death tomorrow, Sunday April 12. Throughout the day, visitors of all ages will have the opportunity to construct red paper roses. These roses will be “planted” to form a rose garden on the Park lawn, facing the bust of FDR. 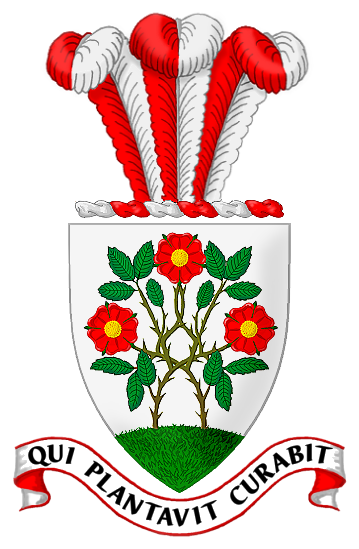 Roses decorate the Roosevelt Family Crest (pictured above), and appear in some of Kahn’s initial sketches of Four Freedoms Park. At 2pm, a commemorative wreath-laying ceremony will take place. Visitors will be invited to place flowers at the Bust, while folk musicians, The Falling Stars, perform an acoustic rendition of "Going Home" and other ballads from the Roosevelt-era. All visitors are welcome to bring flowers to lay at the bust of FDR. As we prepare for expanded hours in the Spring, we are seeking volunteers to join the dedicated and enthusiastic group who have helped us welcome more than 325,000 visitors from around the world since the Park opened in 2012. All greeters receive in-depth training that allows them to discuss the Roosevelt era and the Four Freedoms speech; Louis Kahn's design principles and philosophies; and the story behind the building of the memorial. Additionally, we offer our greeters a number of opportunities to attend workshops, lectures and private receptions. Last year we took a tour of the United Nations and visited Franklin D. Roosevelt's home and Library in Hyde Park. UPDATE 3/12 - Video of the commemoration here. That's 9 weekends in a row. 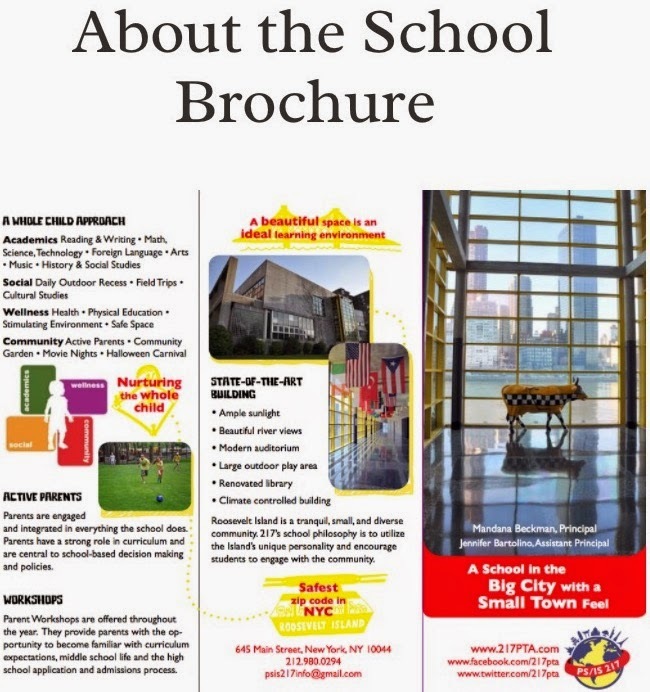 Click here for more information on the PS 217 School Tours. We are excited to offer a full-day UPK program starting in September. We understand that many families are interested in enrolling in the full-day program. Although the Department of Education currently lists one section with 18 slots for full-day UPK - I strongly encourage parents who are interested in the program to apply. We are working with the Dept of Education to explore opening additional full-day slots if there is enough demand. During March 2 Roosevelt Island Cornell Tech Community & Construction Task Force meeting, Cornell Tech Director of K-12 Education Diane Levitt provided this update on relationship with PS/IS 217.
and more information on Roosevelt Island's PS/IS 217 Gifted & Talented Program and Kindergarten class. 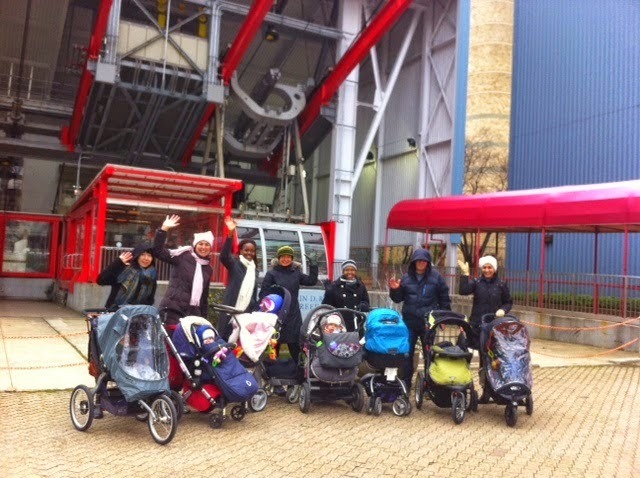 Our next free Roosevelt Island Moms on the Move (RI MoM) event will take place this Friday, April 10, starting at 4.30 PM at the Tram kiosk. We hope that some working moms or dads can join us this week :). We will go for a walk and continue with some exercise (if you want, if not it's a play date) in one of the playrooms. Please let me know if you want to participate so that I e-mail you the playroom location where we will meet at 5pm after the walk or directly in case of rain. 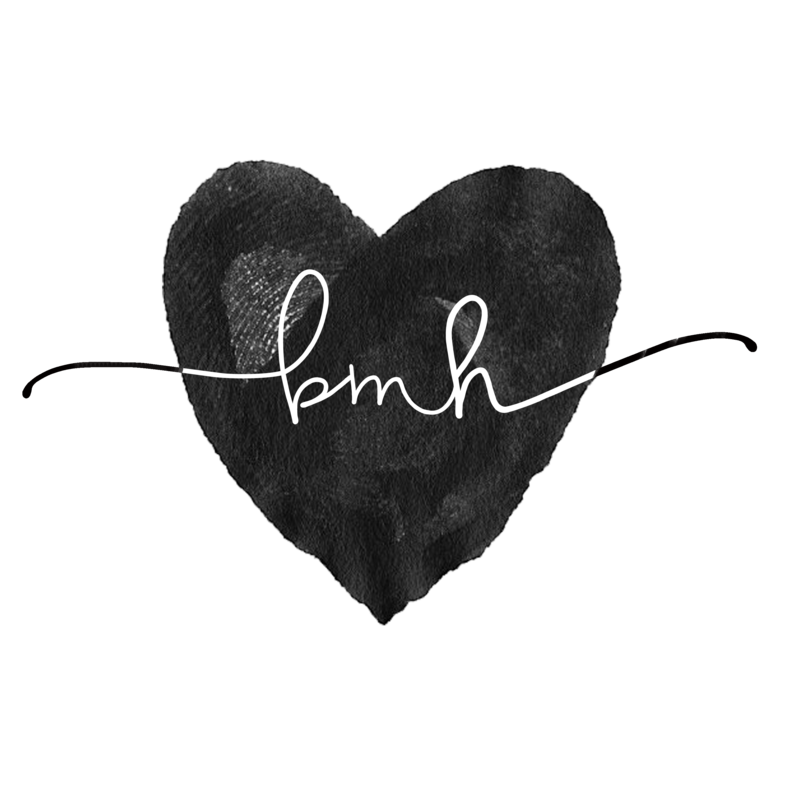 All moms, moms to-be and moms of all ages are welcome, and dads as well of course. Looking forward to seeing you and your little ones on Friday! 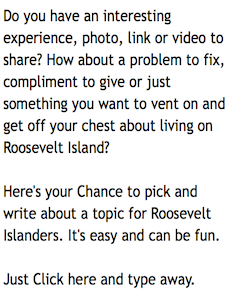 Please contact me for more information on the Roosevelt Island Parents' Network. More information for Roosevelt Island parents. Roosevelt Island's NYC Council Member Ben Kallos introduced a bill to help parents return to the workforce. 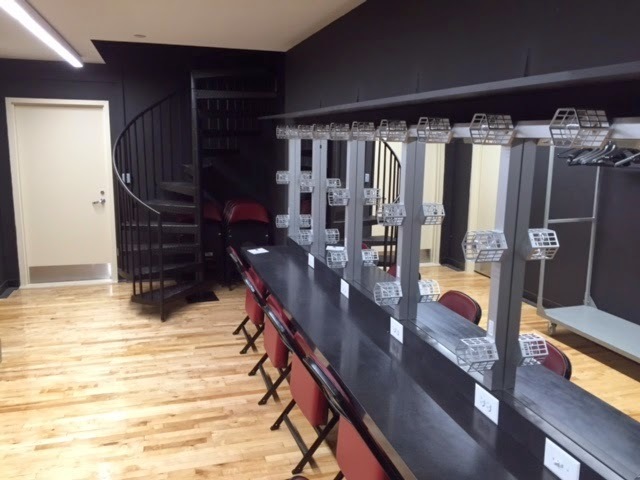 The Roosevelt Island Operating Corp (RIOC) is conducting tours of the newly renovated Cultural Center at 548 Main Street. 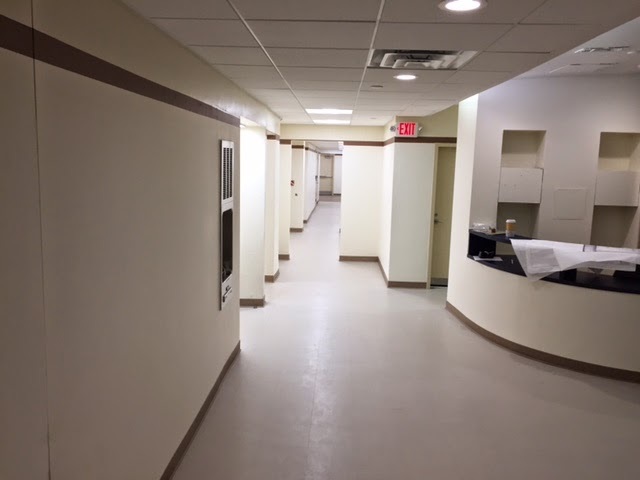 On Thursday, April 9th, tours of the newly renovated Cultural Center will be offered at 10 AM and 6 PM. Advanced signups are recommended. If you wish to attend a tour, please email permits@rioc.ny.gov. 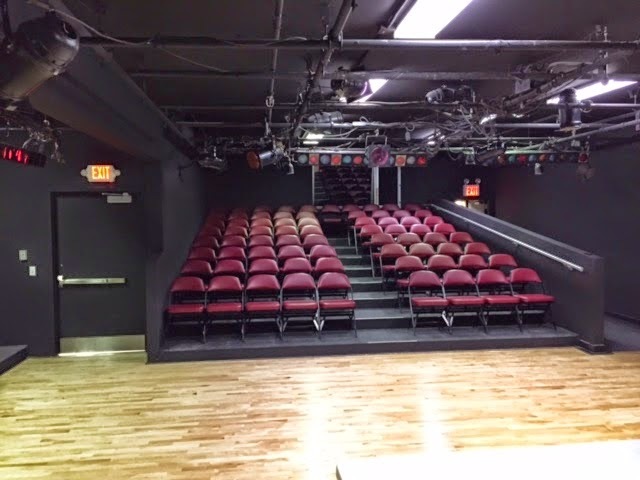 The Main Street Theater & Dance Alliance (MST&DA) license agreement with RIOC for the Cultural Center space is through the end of 2015 at which time RIOC will issue a Request For Proposals (RFP) for the space. 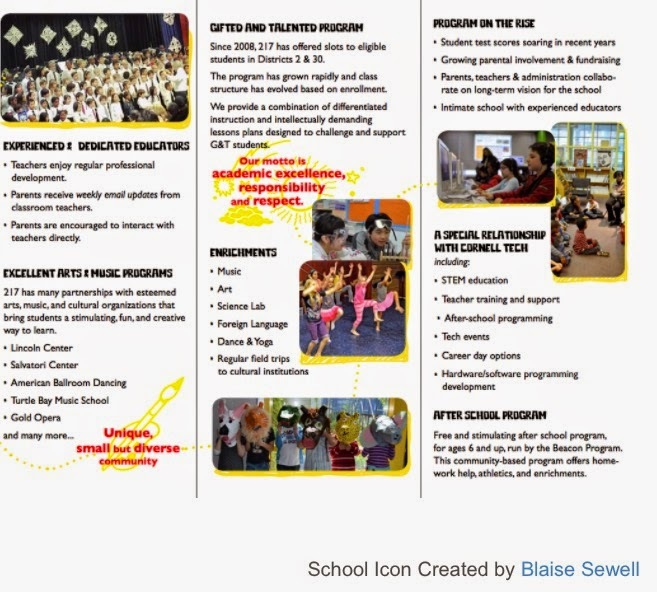 The history of MST&DA will be considered in evaluating the Cultural Center RFP. as well as Common Area adjacent to meeting rooms. 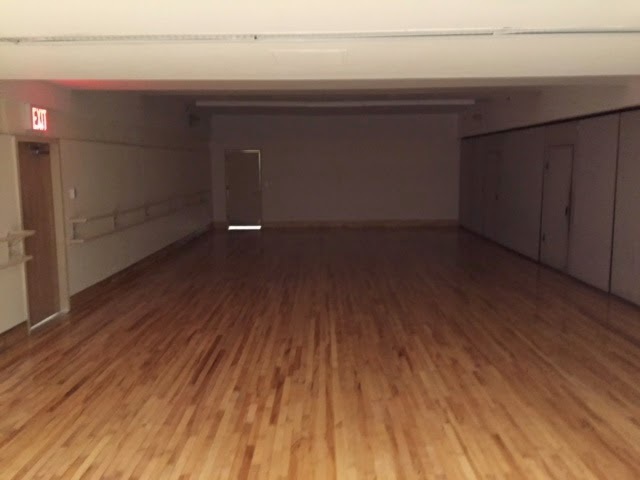 Roosevelt Island Residents and organizations are encouraged to inform RIOC of any interest in using the Cultural Center Space for your meetings or other needs. The Cultural Center use and fee schedule was discussed during the March 19 RIOC Real Estate Development Advisory Committee meeting held at the Cultural Center Theater (audio web cast of meeting). Here's what happened. noting that Public Authorities, like RIOC, are under a great deal of scrutiny from NY State. Ms. Indelicato added that the intent of RIOC is not to make money on the Cultural Center. Part 2. RIOC Community Relations Specialist Erica Spencer-El discussed how the policy and procedures for the new Cultural Center space were determined. Part 3. RIOC's Donna Masly discussed Cultural Center fees and usage policies followed by discussion between the RIOC and residents attending the meeting. Also a very interesting, though brief, exchange (at the 35 minute 30 second mark) between RIOC Board Member Margie Smith, RIOC CFO Frances Walton and Roosevelt Island Residents Association (RIRA) Vice President Sherie Helstien regarding Roosevelt Island ground rent payed to RIOC being owed to NY State due to the State's prior infrastructure investment in Roosevelt Island. Part 4. Discussion regarding why Main Street Theater & Dance Alliance is treated differently than other organizations seeking use of the Cultural Center Space. Also, discussion of religious organizations using the Cultural Center Space. 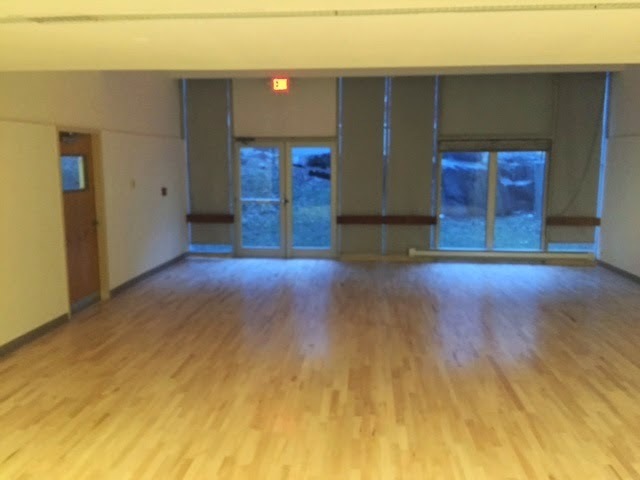 Bottom line, if you are interested in renting Roosevelt Island community space at the Cultural Center sign up to take the tour tomorrow and see the space for yourself. 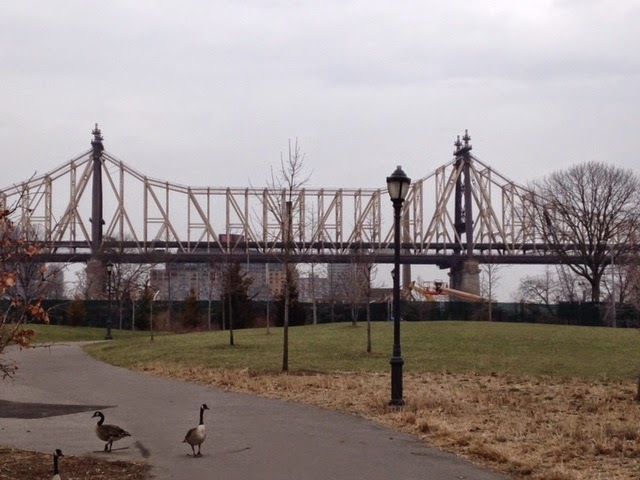 More on Roosevelt Island Cultural Center Community space issues here, here and here. 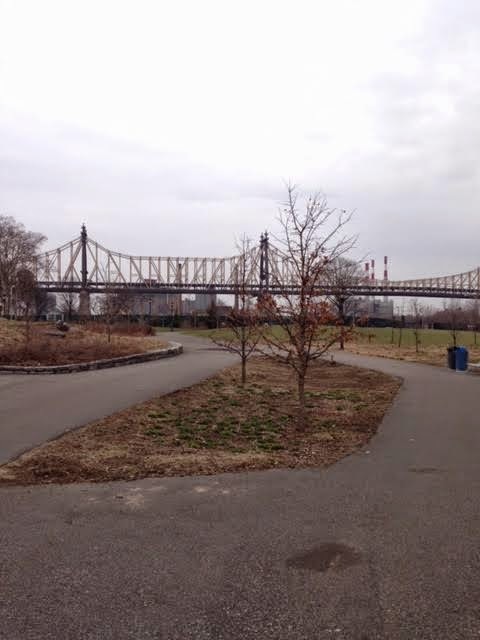 Join this bicyclist on a ride beginning in Astoria, taking the Vernon Boulevard Bike path, going over the Roosevelt Island Bridge, down the Helix, circling Roosevelt Island from Lighthouse to Southpoint Park, back over the Roosevelt Island Bridge and then on to Astoria Park. and a view of the construction site today. April 3 - April 17 Look Ahead. 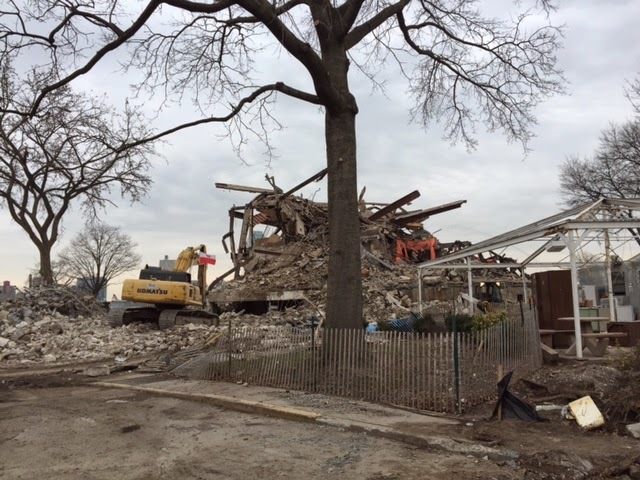 Demolition work continues on Building B, with structural demolition having recently begun. It is anticipated that within the coming two weeks, the last standing Goldwater building will be down on the ground. Foundation removal of Building E is ongoing and will continue for the month of April. As the foundation is removed working north to south, the backfill operation will follow closely behind. Barging operations will be in full swing the week of April 6th. It will take approximately three days to load all the mixed metals that are being removed from the site for recycling. Immediately following that operation will be a full barge of construction and demolition waste leaving the island. Excavation operations are ongoing at the First Academic Building (FAB). As the demolition proceeds south, additional FAB footprint is uncovered to allow for excavation to continue. A limited number of concrete trucks will be used the week of April 6th to pour mud mats. Foundation work is expected to start the week of April 13th, which will include a larger number of concrete trucks. Cornell’s work in the roadways is largely complete for the time being. Con Edison continues to work within and surrounding the site to remove electrical cables that are no longer in use. Their work is expected to continue for another 1-2 weeks. Excavation and rock crushing operations continue in the Central Utility Plant (CUP) footprint, as well as the vault area to the immediate south. 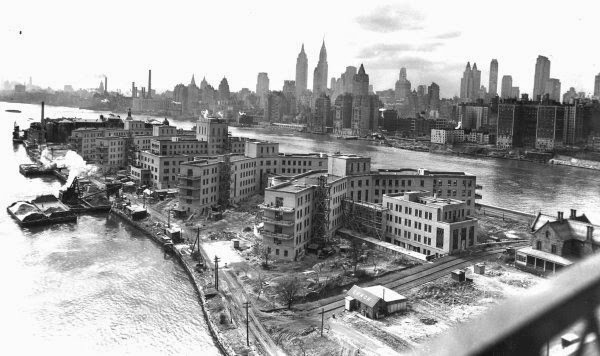 The digging, crashing, smashing and clanging will echo over the East River for a couple more years, as Cornell Tech builds a new campus on Roosevelt Island where the Goldwater Hospital stood since 1939. The patients, many confined to wheel-chairs, have been moved to Coler Hospital at the North End of Roosevelt Island, or to the renovated old North General Hospital in Harlem (now the Henry J. Carter Specialty Hospital and Nursing Facility). Click here for full article remembering Goldwater Hospital. The future use of the Roosevelt Island site is explained by Cornell Tech Dean Dan Huttenlocher on a visit to the Technion Israel Institute of Technology, Cornell's partner in the Jacobs Technion-Cornell Institute. 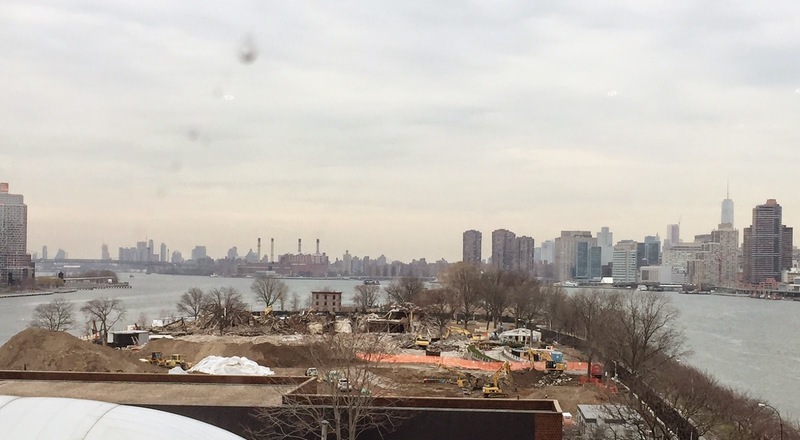 More on the demolition and construction of Cornell Tech campus at this previous post. Following careful evaluation and monitoring of Four Freedoms Park trees, the Conservancy will replace eight Linden trees and one Copper Beach tree due to concerns of tree health and stress. Removal and replacement of these trees will take place on Tuesday, April 7 through Thursday, April 9. This may result in restricted access to certain areas of the Park; please visit our website for the most up-to-date information. The removed trees will be turned into mulch and used in other gardening projects citywide. 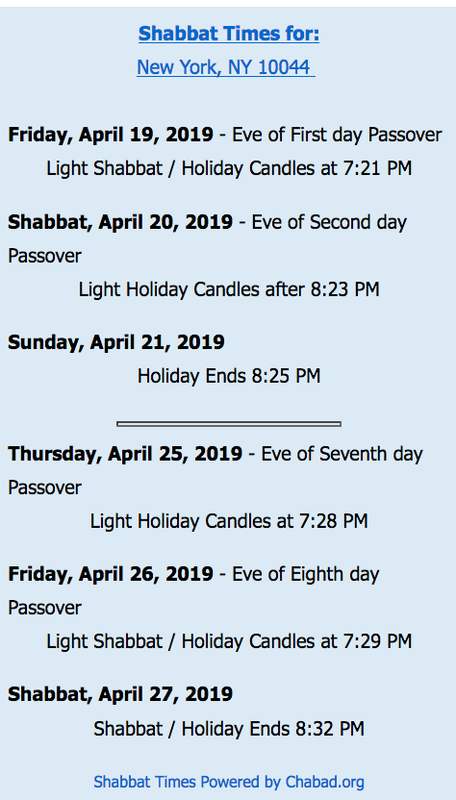 Upcoming Four Freedoms Park events at their website. 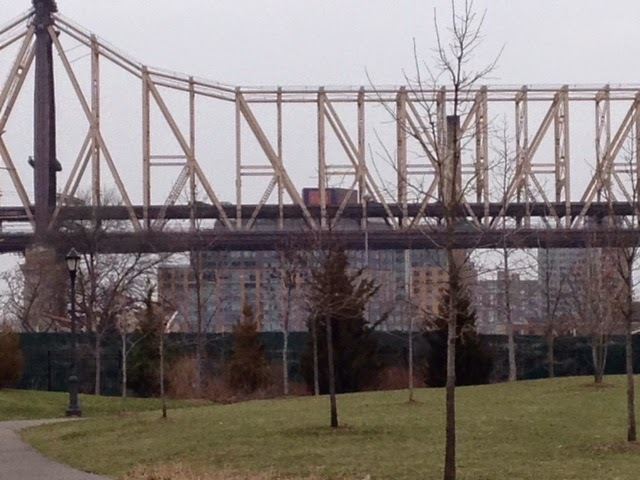 For human stress concerns, try some Yoga at the FDR Park. ... We are very pleased to note that, as result of several years of negotiations, Island House, a 400-unit affordable housing development on Roosevelt Island, will continue to remain affordable to its residents for the next 30 years. The Island House deal is historic in nature and marks the first successful conversion of a State Mitchell-Lama rental to affordable home ownership as a solution to a market-rate exit from Mitchell-Lama. Without the State’s intervention in extending affordability, apartments within Island House, a development at the threshold of leaving the Mitchell-Lama program, would have been allowed to be rented at market rates, severely affecting residents. 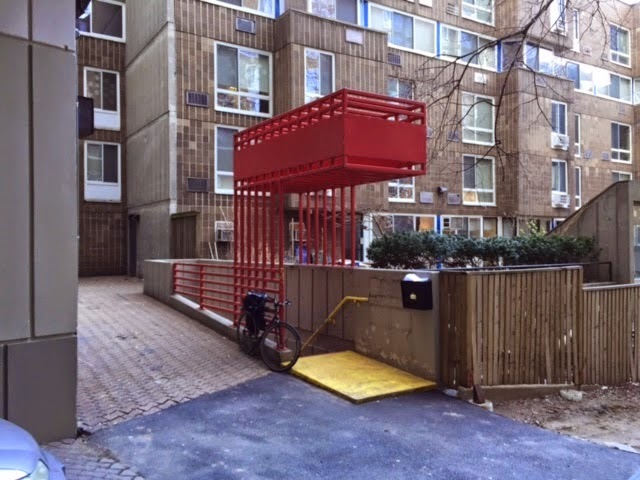 Under the Island House Affordability Plan, Island House, constructed in 1975 as one of the first four modern housing developments on Roosevelt Island, will exit the Mitchell-Lama program. The Affordability Plan, however, protects all current tenants by allowing them to remain in their apartments with future rent increases calculated in a manner similar to rent stabilized apartments. Rent protection will remain in effect for 30 years. The owner of Island House will apply to convert the building to Co-Op ownership. If the conversion is approved, current tenants will be offered the option to purchase their apartments at below market prices. Island House is currently in the process of converting to a Condop (Co-op for residential units and condo for commercial units) under a non-eviction Affordability Plan. It has been a long journey, at least a decade, but the Island House tenants are transitioning into the Affordability Plan that was envisioned long ago: some tenants will continue to be renters with strong rent protections for the next 30 years, some tenants will purchase their apartments at affordable rates. The Sponsor's offering plan was recently amended to offer a buy-out option and extend the exclusive period 20 days (April 20) so that tenants could review the options (rent, buy-out, purchase). The Attorney General will review and declare the conversion plan Effective. At that point, tenants will finalize mortgages, with closings expected to begin in the summer, and the co-op board will be elected. As of today, over 50% tenants have indicated that they will purchase their apartments, so the co-op board will be tenant-controlled with the sponsor holding under 50% of the board seats. 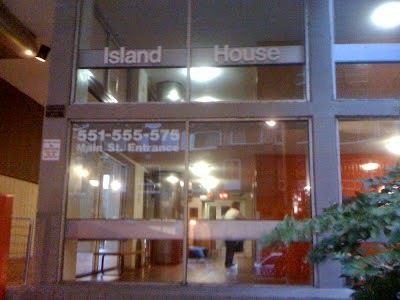 Fortunately for Island House tenants, we have had productive working relationship over many years that has included some tough negotiation with our Sponsor/Owner, represented by David Hirschhorn and moving forward we anticipate collaboration to maintain and expand the quality of life for all Island House residents. Our attorney Stuart Saft, who has literally Written The Book on coop conversion law, has helped guide use through the process with extensive knowledge, skill and effective negotiation. Our government entities, RIOC, ESDC, and DHCR (Rich McCurnin) have collaborated on this Affordability Plan and have created a template that can be used to preserve affordable housing in other Mitchell-Lama building complexes throughout the City and the State. Concurrently, Island House will be engaged in window replacement and energy efficiency program. The windows will be energy efficient and similar to the present windows that slide, and the exterior will have modern treatments that update the faded yellow panels. Island House will also pursue submetering and rent reductions. Island House learned many things from the failed submetering attempts at Roosevelt Landings (Eastwood). Most importantly, Island House tenants already pay their full electric bills within their rents, so any sub metering plan is about apportioning costs that the tenants already pay (and coopters will pay), not adding new costs. The submetering plan, in cooperation with the Sponsor/Owner, will NOT mark-up the low bulk electric rates, incorporate various energy efficiencies, (and we intend to pursue a range of additional conservation options after conversion) and the rent reduction strategy is intended to be revenue-neutral with a special focus by everybody involved in ensuring cost neutrality for those who remain as tenants. We look forward to completing the transition to the Affordability Plan by late summer or fall this year." More information available on the Island House privatization and affordability plan at this June 2012 post which includes video explaining the plan from May 27, 2012 Island House Tenants Association meeting. Information on obtaining a mortgage for Island House residents is here. 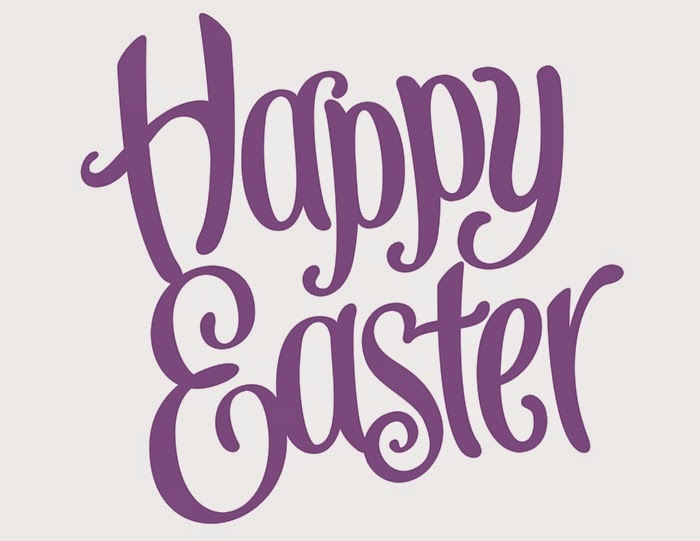 Best wishes for a Happy Roosevelt Island Easter. Put on your Easter Bonnet and Celebrate with Fred Astaire and Judy Garland. 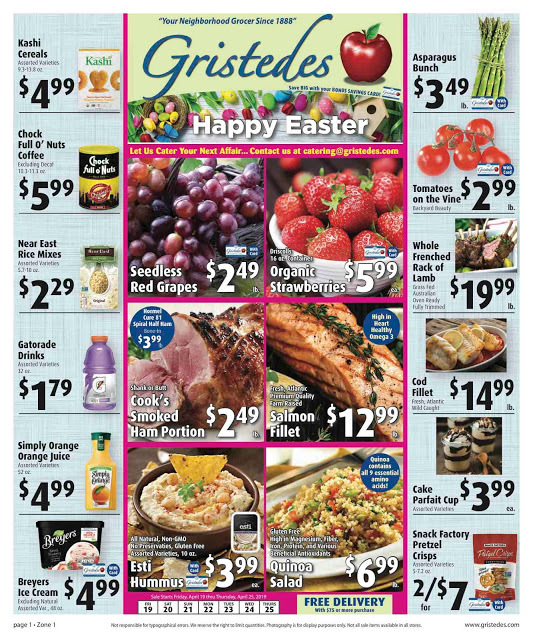 and a history of Easter.